It was a technology feast for me as both a tech entrepreneur and a consumer. Truly fascinating. More than 30 companies were sharing their sleep technology, ranging from market-ready products to early-stage prototypes. As a startup founder who researches and talks about sleep products all day, I often see the problem of products selling promises more than science. Is it the case for the products at CES? With this thought, I went out to try different sleep products at CES. As an essential element of sleep, mattresses are getting the spotlight at CES. Sleep Number Bed has an “experience” section where I could lie on the bed and watch from a screen above my head. Possibly the dream bedroom setup for many people, except that it’s not good to have an TV in your bedroom if sleep is an issue for you. The Sleep Number Bed provides choices for firmness and positioning, which can be automatically adjusted according to your body position. However, the mattress seemed to be overly soft for me, even when on its firmest setting. Beds that are too soft could potentially cause lower back pain, so you should pick what’s most comfortable for you. I learned it the hard way. My boyfriend’s super-soft mattress caused me severe lower back pain from sleeping for just a few weeks. I realized the issue and started sleeping on a layer of blanket on the carpet. Just like magic, the back pain quickly disappeared only days after I started sleeping on the carpet. For me, adjustable firmness is a must. On top of the adjustments, I’m amazed by how mattresses are getting smarter in integrating sleep tracking functions. Besides offering firmness and positioning adjustment, Magniflex monitors the room temperature and noise, and tracks sleep quality by heartbeat and respiration rate. 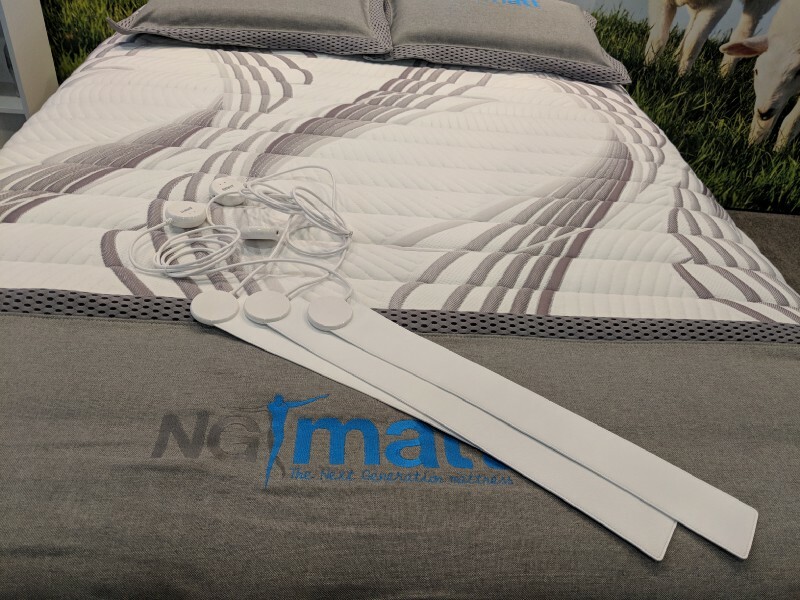 The European mattress NG Matt allows you to adjust the firmness from the app while maintaining the surface level soft enough to eliminate pressure points. It felt very comfortable when I lied on it. NG Matt has pressure sensors to track sleep through heart rate and respiration. They are also integrating with the under-the-mattress sleep tracker Emfit. You can imagine what powerful sleep tracking can result from the marriage of these two. Understanding sleep is still a big part of CES products. That’s why almost every product offers sleep tracking functions. Sleep trackers come in different forms, among which the most commonly seen currently is under-the-mattress or under-the-sheet tracker band. After acquiring the French smart devices maker Withings (their smart scale works great BTW), Nokia officially entered the health and wellness space. 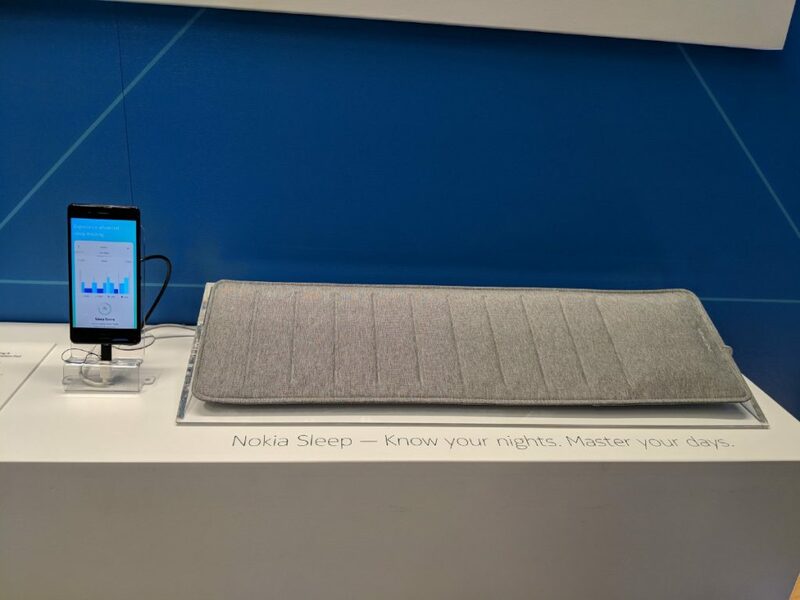 Nokia’s $99 under-the-mattress sleep tracker utilizes pressure sensors to monitor sleep duration and stages as well as heart rate. Interestingly, the sleep tracker also monitors snoring, but through pressure sensors and not microphones. 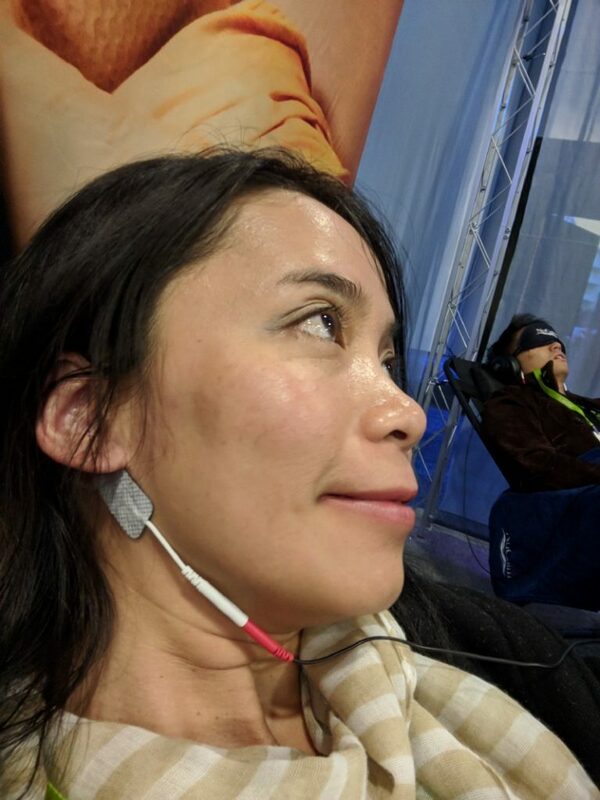 When I asked them the reason for not choosing the obviously simple noise-recording solution, they told me the pressure sensor could distinguish the snoring between the user and the partner more precisely than the microphone. The smart-home feature in the sleep tracker also allows controlling lights and room temperature based on your sleep need. Emfit is a prosumer sleep-tracking product very popular among professional athletes including several NFL teams. Their most prominent feature is heart rate variability (HRV). HRV, detected by ballistocardiography technology in the tracker, is a measure of the variation in time between each heartbeat. Controlled by sympathetic and parasympathetic nervous system, decreased HRV has been shown to associate with worsening depression or anxiety as well as an increased risk of death and cardiovascular disease. According to Dr. Timo Aittokoski, the Chief Scientist at Emfit, HRV is an indication for team physicians to understand how well their athletes recover. The sleep tracker currently has promotions on Amazon for $ 240 compared to the full price of $299. The sleep tracking function of Emfit has been validated with the sleep monitoring gold standard polysomnography (PSG) in a small number of subjects. Dr. Timo Aittokoski told me stories of him strapping himself with dozens of EEG wires to test the product. One downside is, the data from Emfit is directly uploaded to the cloud without going through your phone, so you can’t see the fancy sleep graphs from the app. 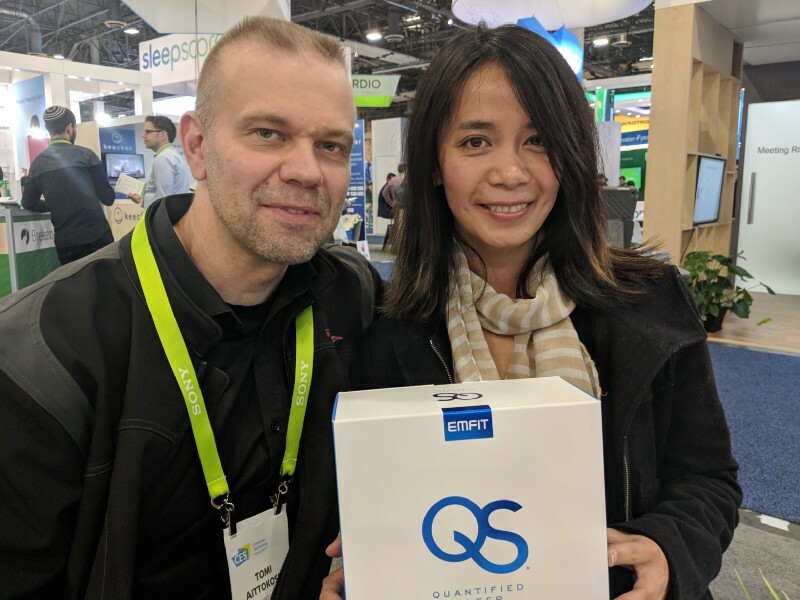 I joked with Dr. Timo Aittokoski that I would buy an Emfit and leave angry messages asking for the feature of displaying sleep results in the app. The Emfit people are extremely friendly and open to discussion. We sat down and talked about the science for almost an hour. As Dr. Timo Aittokoski said, “It feels good to have meaningful discussions.” The feeling is definitely mutual. Dr. Timo Aittokoski and I had a great conversation about sleep science. Sleepace and Snail Sleep are two Chinese companies offering similar sleep trackers as Embit, except that Emfit tracker is under the mattress and Sleepace and Snail Sleep are both placed right under the bed sheet. I was wondering if such tracker bands would be uncomfortable being just under the bedsheet, but they both seemed fine during the short time when I lied on the sheet. All tracking bands use pressure sensors for movement, respiration, and heart rate, which are proper parameters reported in scientific literature to monitor sleep. The key to differentiating similar products is the data interpretation algorithm. 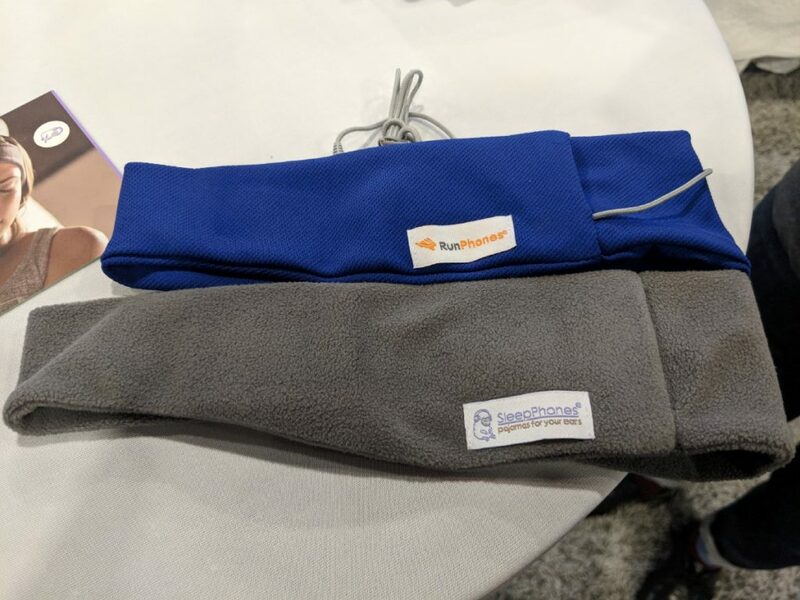 For the sleep tracking function, one will have to compare sleep data from these trackers side by side and validate them with the sleep monitoring gold standard PSG for their algorithm. Light therapy improving sleep has been well established by decades of scientific research. It’s based on the biology of how the body responds to light. 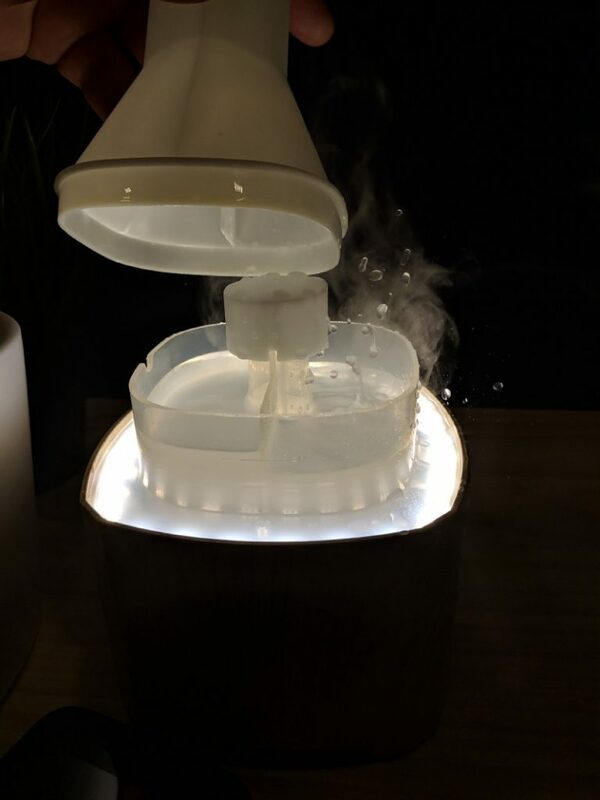 There are a number of companies offering light therapy to improve sleep at CES, among which bedside lamp to assist falling asleep and waking up is most popular. Sleepace and AromaRest offer white and blue light in the morning in their wake-up module and red and orange light as night-time module. AromaRest also offers two different aroma scents for the morning and evening. Although it is believed that aroma therapy helps relaxation, I’ve personally never find them to be effective. Despite having well-established science behind light therapy, people from these companies seem to have less understanding than they should do on how their products work. The Sleepace representative told me that “red light stimulates melatonin” is the science behind their bedside lamp for falling asleep. That statement caused some secret eye-rolling inside me. As we know, during the daytime light input inhibits melatonin secretion through the suprachiasmatic nuclei. During the night time, the inhibition is reduced resulting in melatonin production by the pineal gland. Since blue light is most effective at stimulating this inhibitory pathway, exposing your eyes to longer wavelength light, such as red and orange, before bed helps to diminish the inhibitory effect of blue light on melatonin. In the morning, exposure to light (especially blue light) stimulates the sympathetic nervous system and the secretion of cortisol, waking up the body to prepare for the day. 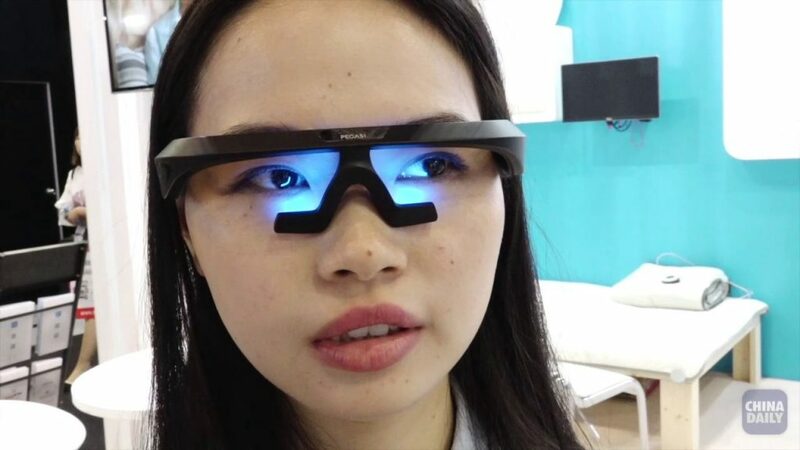 Other than bedside lamps, some companies such as Pegasi and Dreamlight also offer light-emitting goggles or sleep masks to help the users fall asleep and wake up. While the science is solid for light therapy to improve sleep, the critical question for continuous light therapy is user compliance. Having blue light shining into your eyes is not a new idea. We’ve seen many similar products out there, as early as Re-timer. None of them have taken over the market, and we’ve heard many users complaining the discomfort of using them. I can certainly sympathize with not wanting to wear some space goggles shining blue lights into my eyes for hours on end. 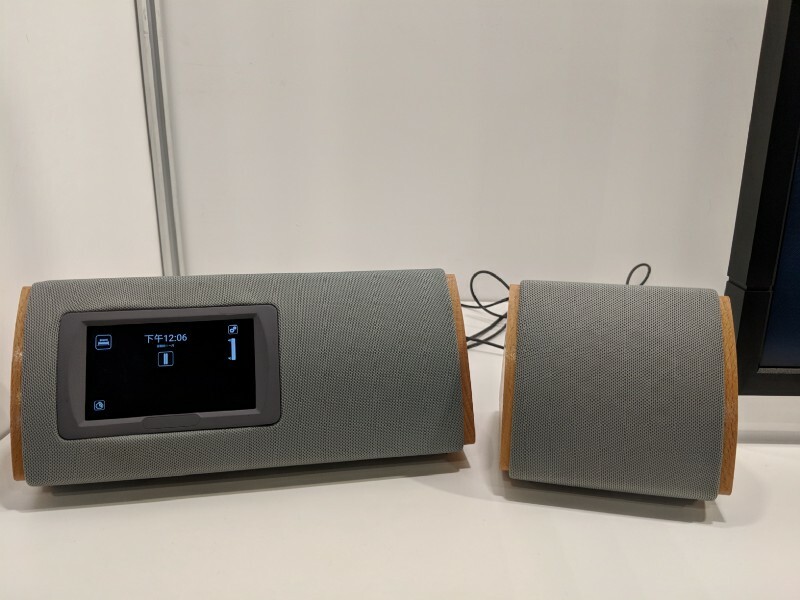 It is widely believed that relaxing music is good for sleep, which is why almost every sleep product at CES offers audio guides intended to help users fall asleep. These come in various forms, ranging from bedside lamps with audio, speakers/alarms, microphone-embedded sleep mask and soft headbands, to hard headbands like the ones by Philips and Rythm. Music is not a bad choice. I tried using Zen music as well as natural ocean or creek sounds from my phone to fall asleep, which worked for the first a few nights, but stopped working afterward. Microphone-embedded wearables all face the challenge of comfort, especially for side-sleepers. The hardware stands out dramatically in the Sleepace sleep mask and the SleepPhones sleeping headband. After trying them on for a few minutes, I can’t imagine anyone being able to sleep with them. I was trying to see if I could feel the microphone from Sleepace Sleep Mask, and the answer was YES. To solve this problem, Snail Sleep developed clever solution. The microphone-embedded pillow from Snail Sleep plays music around your head. The electronics inside the pillow are totally impalpable. Despite being a not-so-great sleep product, Sleephones has a twin product microphone-embedded running headband, which is a way more reasonable product if you don’t want to deal with the earplugs and wires when running. They are offering a 20% discount online if you use CES2018 as the promotion code. I bought one myself right after coming back from CES. Trust me, the RunPhones is a much better product than the SleepPhones (photo by Biquan Luo). Besides soothing music, ambient white noise is also shown to improve sleep. Do you feel that sometimes it’s easier to fall asleep on the plane with the humming sound? At least I do. Nightingale creates a “sound blanket” that masks irregular indoor and outdoor noises with white noise. In their study with Harvard Medical School, sound blanket was shown to improve sleep onset latency in healthy subjects. However, white noise is not a magic bullet for everyone. Some people are extraordinarily noise-sensitive and prefer quiet sleep environment. Soothing music and sound guidance are like bandages for sleep. They may work in some cases or for a while, but they can’t solve sleep problems on a fundamental physiological level. 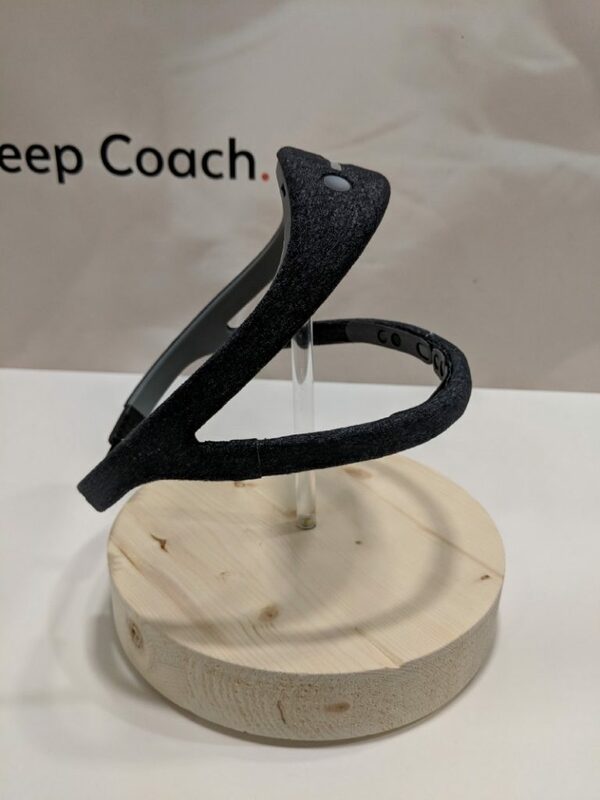 The supposedly cutting-edge brainwave-training products from industry giants and startup companies attracted a lot of eyeballs at CES. This category includes Philips Smart Sleep, Dreem by Rythm, and Somnuva by Safella. All of them deliver brainwave-manipulating beats by audio. They are the ones that received most of my skepticism based on my understanding of sleep science. Philips is not a stranger to the sleep space. Leaping from the traditional Philips goLITE BLU light therapy box based on well-established science, this time the company is launching a sci-fi type of sleep solution for the VIPs who are too busy to sleep. The Philips Smart Sleep wearable headband claims to make users feel more rested and refreshed without changing how long they sleep. Based on information from their website, the device emits sound tones to enhance the “slow waves” in your brain during deep sleep. The $500 Dreem from France is a very similar product as Philips Smart Sleep, from the form factor (both hard headbands over the top and the forehead), the sensors (both EEG sensors and accelerometers), and the working mechanism (both slow brainwave booster). 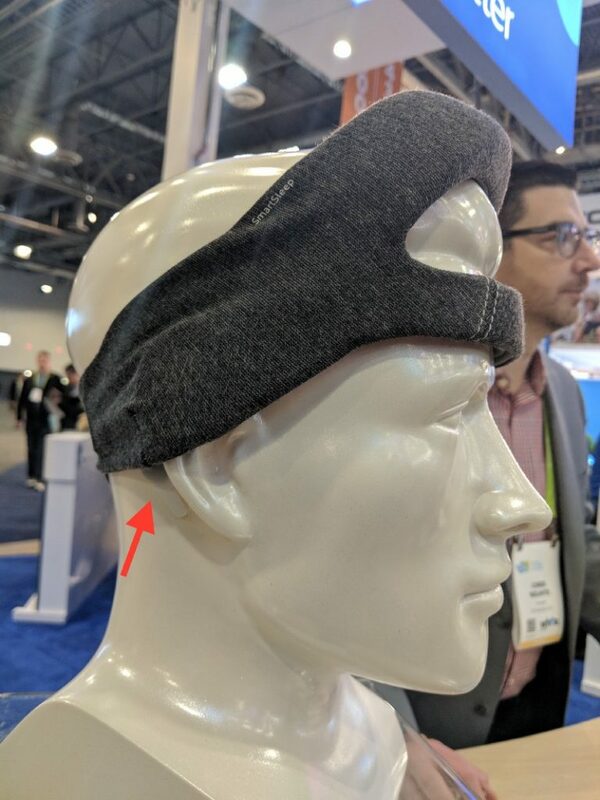 One visible difference is that, the Philips Smart Sleep rigid headband also comes with disposable patches that go underneath the earlobes, which seems very uncomfortable to wear throughout the night. Both products emit low pitch beats to supposedly boost the slow wave in the brain. As the effect of such boost, Philips Smart Sleep claims to allow more rested sleep from the same length of deep sleep, and Dreem claims such bone-conducted beats can optimize sleep by increasing the average range of Delta Waves by 40% and average frequency by 32%. The pictures are great, but the science is not there yet. As Dr. Jamie Zeitzer at Stanford University explained, even though sound and light are known to change brainwave, so far it hasn’t been proven that manipulating slow waves (the delta wave during deep sleep) improves sleep functionality. It’s still unclear whether the slow waves themselves are downstream of the functions of sleep or a pathway to change sleep function. Scientists tend to believe the former, in which case enhancing slow waves is not expected to improve sleep. In fact, changing delta brainwave could potentially be harmful for the brain. Dr. Zeitzer said, “I would very much worry about changing the frequency of a brainwave”, as “the frequency is likely key for the synchronization of distant brain regions.” That being said, manipulating brainwave to improve sleep is more of a promise than reality. Soothing melody before bed, however, could potentially help you calm down and get ready for bed. Different from Philips Smart Sleep and Dreem, Somnuva’s brainwave-training program aims to shorten the sleep cycle so the users get the same restorative sleep in the shorter amount of time. Based on my literature search and communication with Dr. Zeitzer, neither of us is aware of any literature in which the length of the sleep cycle was changed. It’s still a question of whether it can be done, and whether the changes result in the same good quality sleep in a shorter time. Even if it doesn’t work, you can still buy it as a speaker. According to the Somnuva people, their $500 speaker pair is made with excellent audio quality. Besides the magical brainwave-training products, there are sleep training products at CES that do not involve manipulating brain waves. Shleep is one of them. The sleep coaching app and corporate sleep program offers a personalized sleep assistant based on behavior suggestions. It was developed by Dr. Els van der Helm, Ph.D. in Psychology and former consultant at Mckinsey. Cognitive behavior therapy for insomnia (CBT-i) is a well-established method for treating insomnia by doctors in the sleep clinic. The key to CBT-i success is understanding how sleep works, dissecting factors undermining sleep, following the regimen strictly, and be patient about the progress. Traditionally the interactions with sleep doctors is critical for the whole therapy. The challenge with internet-based CBT-i for insomnia is how to create effective interaction so that the users stick to the program. A number of scientific studies have shown that internet-based CBT-i is effective in improving sleep. 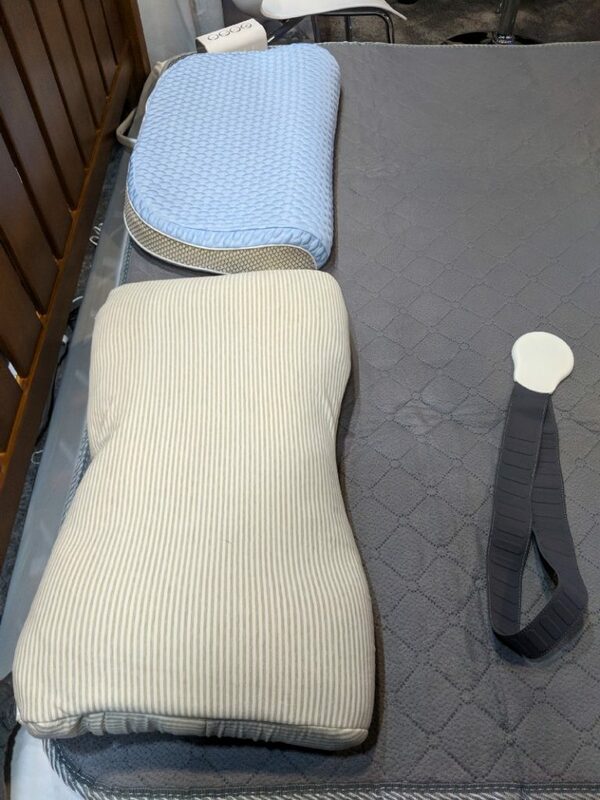 Besides classical CBT-based sleep coaching, nonstandard sleep coaching products were also seen at CES. One is a breathing hugging pillow from Somnox. The Somnox breathing pillow provides breathing program that induces the user to relax and fall asleep. Not sure how much a breathing robot can synchronize your breathing rhythm, but breathing exercise is a good pre-bed ritual to relax and clear the mind, although you probably don’t need a $500 robot to help you breathe. The Thim ring by Re-timer is another sleep training product. Put on before bed, the ring will gently wake up the users after 3-minutes of sleeping, and repeat the cycle for 1 hour until they completely fall asleep. This brutal regimen is supposed to condition the users to fall asleep faster. Based on my understanding of CBT, the disruptive 20 sleep-wake cycles in one hour is probably a form of sleep restriction which exhausts the users to shorten their sleep onset latency the next night. I can’t imagine myself using it, just because of how the annoying treatment sounds, but hey, no pain no gain. While most products are targeting to have a good night sleep, Nu Calm offers a relaxation package that allows the users to “get the benefit of 2 hours of sleep in 20 minutes”. This promise seems too good to be true, my curiosity urged me to offer myself for a 20-minutes experiencing session. Make no mistake, it’s not intended for sleep or even napping. You are supposed to stay awake as in a meditation session while Nu Calm boosts your alpha brainwaves. To use the product, I was instructed first to apply some cream containing GABA (the chief inhibitory neurotransmitter in the mammalian central nervous system) onto my neck around the carotid artery, the put two electric patches underneath my earlobes, and then put on a sleep mask and connect to the audio. During the experience session, I did observe dramatic muscle relaxation and heart rate reduction. Shortly after the experiencing course started, despite me being fully awake, Fitbit showed that my heart rate dropped to as low as the level when I am in deep sleep. The physiological changes happened so dramatically in such a short time, making me wonder if the forced relaxation came from the cream, and what the long-term effect would be with such product. I felt slightly soft and dizzy after finishing the 20-minute session, similar waking up from deep sleep or some mild muscle relaxant or anesthesia treatment. Strangely, I did have more energy than my friend at the end of the day, even though we were both sleep-deprived from a 6-hour sleep trying to accommodate the crazy schedules at CES. It’s also important to note that I tried many sleep products on the same day, so it’s tough to say which one contributed the most. 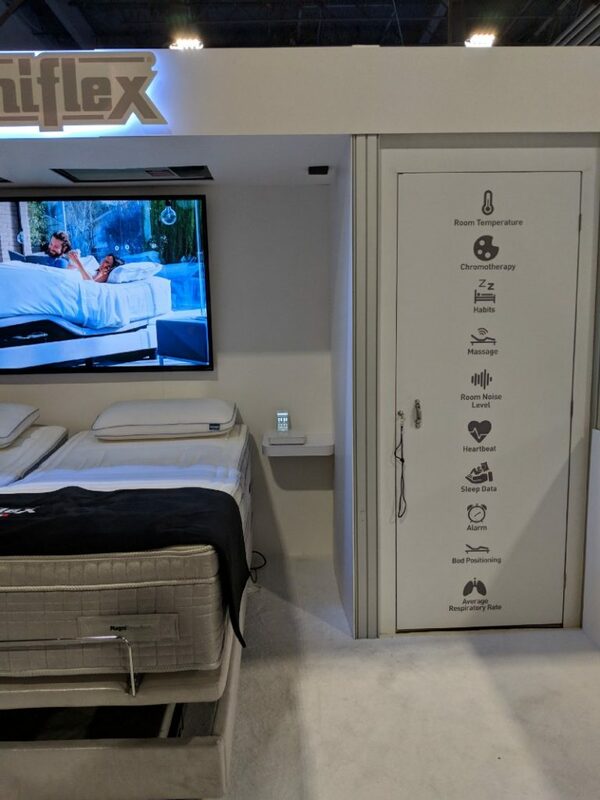 As the founder of a sleep technology company, I’m glad to see these many sleep products at CES. It means that people are becoming more aware of the role sleep plays in our health. 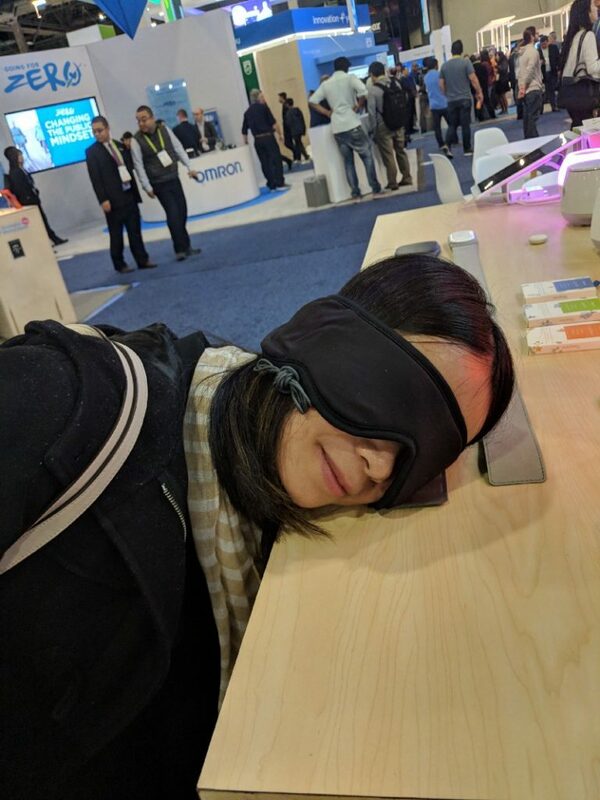 As a consumer who’s searching for sleep solutions with a critical eye, I’m happy that my curiosity was satisfied and there are products out there that I wanted to buy (most of the products offer CES discount, too). Despite a lot of sleep products moving faster than the scientific research in the lab, most of the sleep products are not harmful to try (except possibly the brainwave-manipulating ones) if you are willing to take the financial risk. If you are looking for a sleep-improving product with a solid scientific base, we are launching our light-therapy sleep mask later this year.The sleep mask is based on research at the Stanford Sleep Center and improves sleep by optimizing the biological clock in the body. It’ll be your go-to sleep solution if you believe in solving the sleep problems by working with your body’s natural biology.